On their latest CD, Supernature, Goldfrapp has put together a successful mix of 1980-era New Romanticism, German cabaret, and T. Rex glam that leaves you riveted even through the album's lulls. It's a great amalgam that sounds current without sounding at all dated. 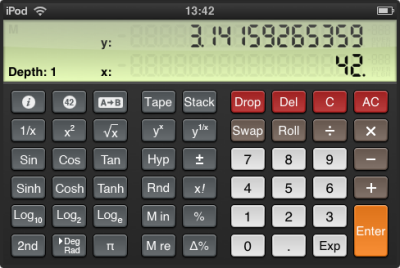 Appleis scientific calculator in the iPhone 2.0 Update is a nice addition, but it lacks one thing many scientists who have an original Hewlett-Packard scientific calculator want -- Reverse Polish Notation (RPN). TLA Systems, Ltd offers that in its PCalc for iPhone. PCalc is for scientists, engineers, students and programmers. Its features, in addition to RPN logic, include a paper tape, unit conversions, engineering and scientific notation and hex, octal and binary calculations. Like the Apple iPhone 2.0 calculator, it works in two modes: vertical mode is a minimalist calculator and rotating the iPhone to horizontal reveals many more scientific functions. RPN is available in both orientations. One cool feature is the "shake to clear" operation. PCalc 1.0 for iPhone is priced at US$9.99.